We enjoyed the butternut squash risotto a lot, but what else to make with the left-over butternut squash? 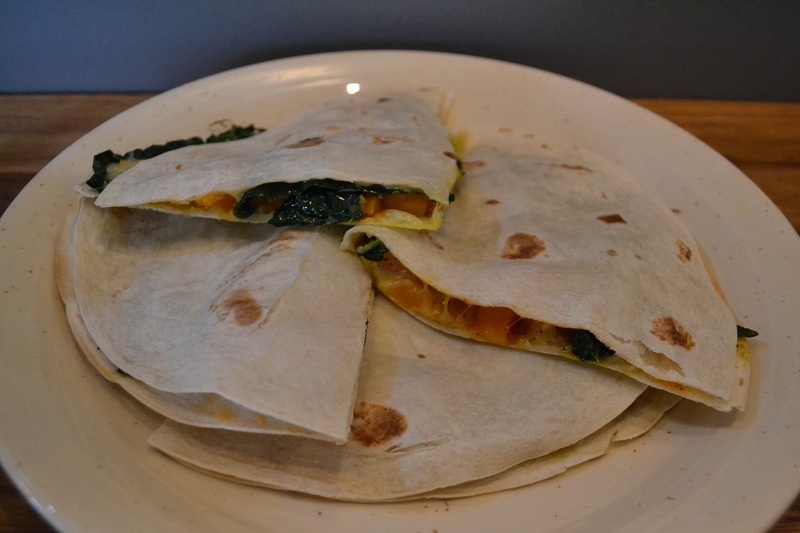 Inspiration came from the Pioneer Woman http://thepioneerwoman.com/cooking/2013/01/butternut-squash-kale-quesadillas/. I love quesadillas. I love butternut squash. I love kale. And I love melted cheese. However, I would have never thought that a combination of all of these would taste good. Was I wrong. So slightly modifying the recipe by Pioneer Woman, here is what I came up with. 1. Heat butter and olive oil in a small skillet over medium heat. Add the squash and add salt, pepper, and chili powder to taste. Cook for several minutes, gently turning frequently. Cook until the squash is deep golden brown and tender. Make sure to not over-cook, squash should not be falling apart. Remove squash and set aside. 2. Add torn leaves to the same skillet. Toss the kale around and cook it for 3-4 minutes. Add the sautéed squash and heat through. 3. Meanwhile, pre-heat the oven to 325 F. Arrange the first tortilla on a baking sheet (I used the round one for making pizza) and spread the butternut squash kale mixture on the tortilla. Sprinkle the butternut squash and kale mixture with sprinkled cheese. Layer the second tortilla on top. Bake in oven for 5-7 minutes, or until cheese is melted. I like “baking” quesadillas. It allows the tortillas to get hot and the cheese to melt, without adding fat (and their associated calories) by sautéing tortillas in a pan with butter. Categories: Appetizers & Snacks, In The Kitchen, Main dishes | Tags: butternut squash, kale, quesadilla, tortilla, vegetarian | Permalink. This recipe came originally from a weight-loss recipe that my boss was making. 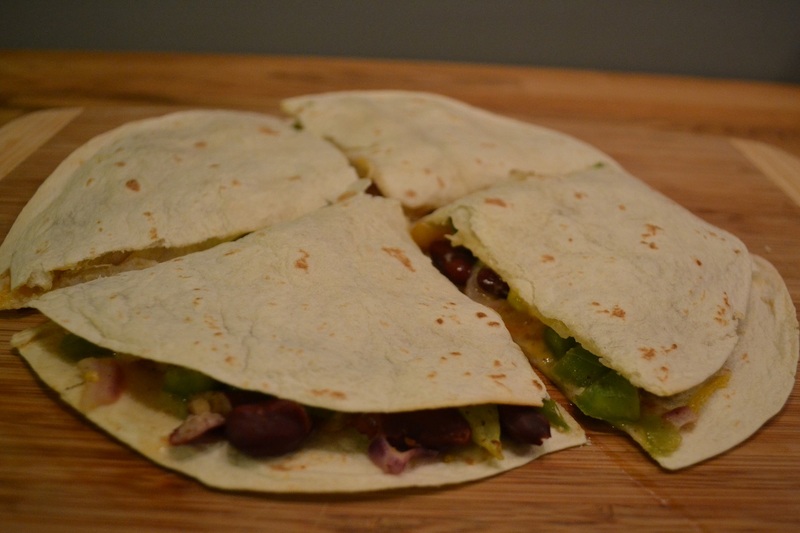 Well…the idea was great…but I ended up modifying the recipe over the years quite a bit…and the recipe has morphed into a vegetable quesadilla that is versatile and explodes with flavor. 1. Cut the onions, tomatoes, and bell pepper. 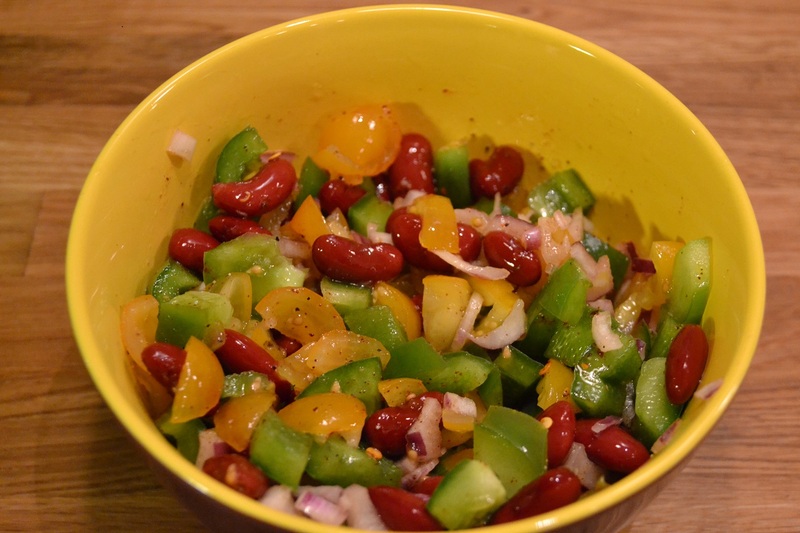 Place in a bowl and season with the spices. Add beans, if using. Mix. 2. Place one tortilla on a baking sheet and spread the vegetable mixture over it, leaving the outer 1/3 inch (approximately 13 mm) uncovered. 3. Sprinkle with the shredded cheese and cover with the second tortilla. 4. 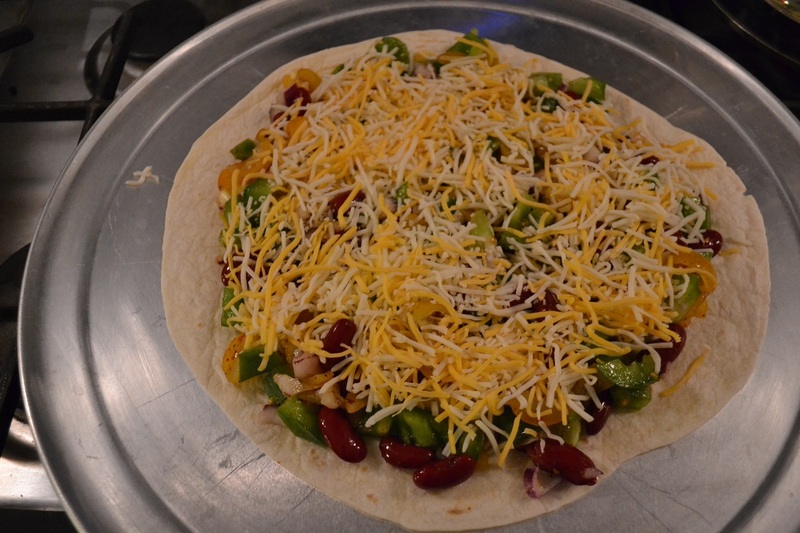 Bake in preheated oven (425 F) for about 5-10 minutes, or until cheese inside the quesadilla is melted. Categories: In The Kitchen, Main dishes | Tags: cheese, quesadilla, vegetarian | Permalink.